Willow Grove Stables offers a variety of summer camps each year: Horsemanship, Training and Coaching and Ladies Pampering Camp. For further information than what is listed below, please feel free to contact us. 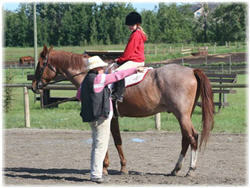 Six hours of instruction daily including two hours of mounted activities. The dates for the 2019 horsemanship camps are coming soon. Please contact us directly at info@willowgrovestables.com for more information. Whether your goals are competitive, achieving your rider level certificates, preparing for your coaching levels or recreational riders with specific training needs, the camp will provide a unique, intensive and fun way to meet your goals. The additional two days of camp will allow our participants Discipline Specific training such as Course Design for Hunters, Jumpers, and Equitation, Equine Canada Rules, Competition Simulation Training, Speed and Pace Control, Cross Country schooling and Learn To Ride program Evaluations. The dates for the 2019 Specialty camps are coming soon. Please contact us directly at info@willowgrovestables.com for more information. Coaching Camp information has been moved to here! The 2019 dates for the Ladies Pampering camp TBA. If you are interested, please RSVP with info@willowgrovestables.com. Please indicate what dates you are interested in as space is limited. © 2019 Willow Grove Stables Inc.